There were several reasons that lead to my restarting the Kundalini Yoga Classes earlier this year, not the least of which was that I knew if I was teaching Kundalini Yoga, it meant I was practicing Kundalini Yoga. That is the only way to enjoy the benefits of Kundalini Yoga, by actually doing your daily sadhana (spiritual work). In addition, I always feel that if you take up something then you ought to try to master it, or at least try to do it well. To this end, Yogi Bhajan’s constant reminder, “If you want to master something, teach it”, also inspired me to get back to teaching this great science of Kundalini Yoga. So since April my Kundalini Yoga practice has been picking up in consistency because as I am the teacher, I can’t just conveniently skip class :-). This perhaps needs some clarification as in other types of Yoga, the teacher does not necessarily practice with the class, but, instead oversees and corrects the students more. It is not so for a Kundalini Yoga teacher. 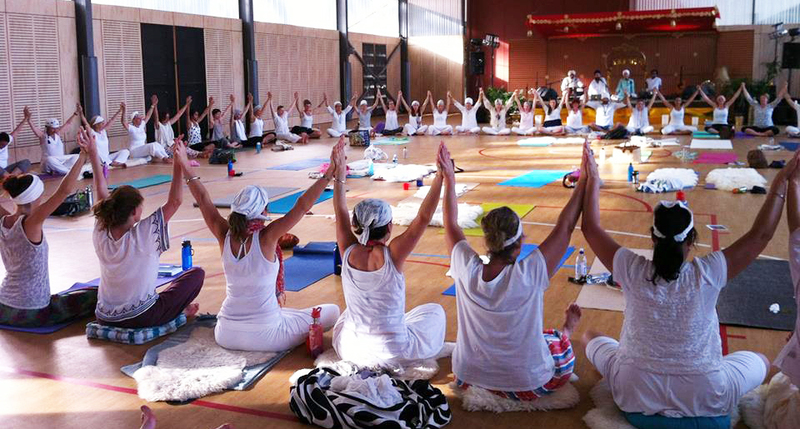 A Kundalini Yoga teacher practices everything with the students and simultaneously monitors and teaches the class. In addition, I have been steadily adding classes as the demand has been increasing. So, guess what, it means I am committing to and doing more and more Kundalini Yoga practice myself. The sum total of all this great Kundalini Yoga practice is that the benefits are coming in fast and thick. A few classes ago I experienced a profound change in consciousness as Kundalini Shakti surged up my spine and into my higher centers (chakras) and now in class I find that as soon as I begin, its like hitting a switch and I am drawn towards great energy, power and vastness. For example, in class this past Thursday within a few minutes of starting, great delight and joy began pouring into my being. The consequence of this was the emergence of a very delicious smile that comes upon one spontaneously, without one’s volition. I call it the Smile of the Buddha and it is a state of pure, unconditional, unadulterated, peace & happiness. I have also come upon this state in meditation, specifically when practicing advanced Silent Mind Meditations or Zazen – Zen Meditation. This joy and happiness continued well after class was over and deep into that night as well. Although they are not the sole reason for my Yoga practice, these experiences are certainly motivating me to deepen my Kundalini Yoga practice even further. The fundamental reason for my meditation and yoga practice is quite simply, due to an inexhaustible passion for the Truth. Let me go ahead and list here some of the benefits I have noticed from doing the consistent Kundalini Yoga practice over the past few months. You can also read the following articles which discuss the benefits of Meditation practice and Yoga practice: Top 10 Profound Benefits of Meditation, Top 10 Health Benefits of Yoga, Top 5 Benefits of Group Yoga Practice. 1. Greater awareness of my True Divine Nature. 2. More spontaneous flow of Joy & Happiness. 3. Greater Peace and ability to stay calm in the face of storms. 4. Better Health (have cured a digestive issues that was recently plaguing me). 5. More Strength, Energy, Fitness & Vitality (just ask my wife;-). 6. Greater Clarity of Thought. 7. Some truly mind blowing transcendental experience :-D (some during class, others happening spontaneously and sweetly without beckoning). I am excited and inspired by all these benefits from doing consistent Kundalini Yoga practice for just a few short months and am glad I took up the challenge of opening the Yoga center and teaching the classes again. Don’t get me wrong, there are days I don’t feel like teaching and I feel overwhelmed by my commitments, but, then… the students arrive… we settle down in class… close our eyes and begin our practice… and I realize there is no where else on earth I would rather be than right there with them practicing and benefiting from the profound art of Kundalini Yoga. If you would like to start benefiting from Kundalini Yoga Practice, but don’t have a good teacher in your area, you are welcome to join the Free Online Guided Meditation & Kundalini Yoga Classes offered on Mastery of Meditation. The benefits of practicing kundalini yoga are second to nothing that ive found. the beautiful thing about this exercise is that you’re working on the energy body and you’re getting a physical workout too. Breath work and overall body strength and conditioning. Thank you so much for so generously sharing the Way to the Truth with us all.I’m starting the onlne Kundalini yoga course today and dedicate my first sadhana as a guru-dakshina to you. Thank you for stopping by and your valuable feedback. It is up to the teacher to practice with the class or not. Generally teacher’s practice some of the poses and not others. My wonderful teacher Ravi Singh would practice with us for quite a few of the poses and it was very inspiring and motivating for us. You will find your own way to teach as you listen to your inner voice for the ultimate guidance. I am also a KY teacher and am currently preparing for my exam. Researching on KY background and differences to other forms of yoga, I stumbled across your site. I can relate to your story, but I would like to point out that a Kundalini Yoga teacher does not practice with students at the same time unless leading morning Sadhana, where he joins for the postures but doesn’t do the relaxation.